As a parent it’s scary letting your child use social media and browse the internet. The world is becoming more and more accessible every day, and with that, so are our children. With stories hitting the headlines every day it’s more important than ever to know what your child is doing on their smartphone. 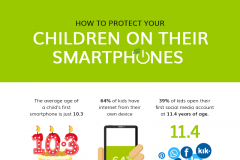 Today, children are online from as young as three years old, with the average age of a child receiving their first smartphone .